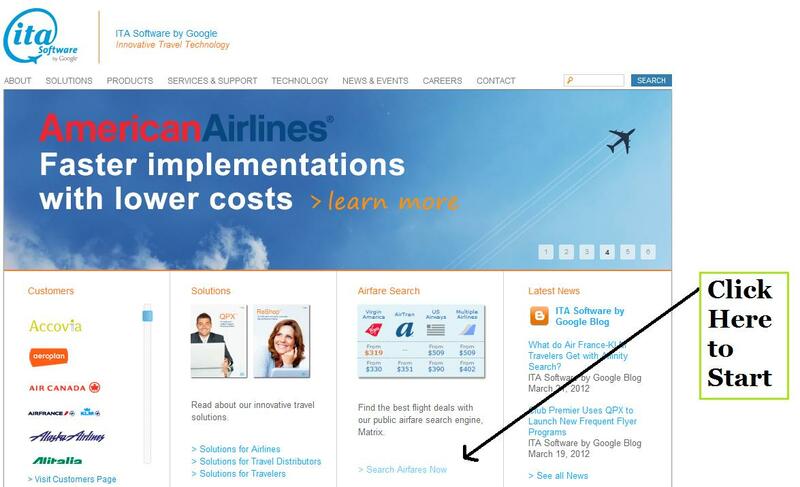 Usually when someone books flights they either go through a travel agent, website or directly with the airline. Using an agent is usually the best way to go but it takes the most time. You either have to call or email and may not get your results right away. Booking through one of the thousands of online websites is quick and efficient but do you really know if it’s the best deal out there? Dealing directly with the airline is excellent when you have situations such as missed connections, delays or cancelled flights. However, they will always book you with their alliance of partners and will not let you know about all the options. This is where itasoftware.com is extremely helpful. It gives you the information travel agents access directly at your fingertips. Firstly I should mention you can’t book your tickets at itasoftware.com. It will show you every option and then you can book directly with the airlines, an agent or piece together your planned itinerary on Expedia. Google recently bought itasoftware.com and knowing them I’m sure in the future they will tie in a booking option directly. The beauty of this site is its flexibility. You are able to enter multiple departure or destination airports so if there is more than one airport at your destination you can check both with one search. If you are looking to go a certain area you can also search any airports within 300 miles of the cities you choose. If you are flexible with your travel dates itasoftware gets even better. It gives you an option of showing the full month of fares to your destination. Sometimes flights are half the price a week earlier so this tool gives you a better grasp of the market at the time you want to travel. You also have an option of choosing a range of days for your length of stay. So if you are looking at a trip for 7-10 days, with one search you can find all the results. 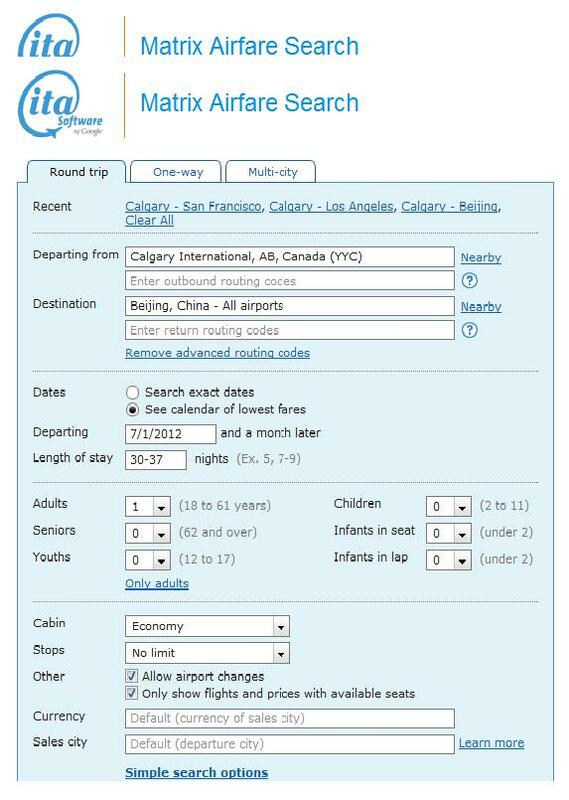 If you don’t want multiple connections, you can also select only non-stop flights to show up in the results. If you need to cut your vacation short for any reason, you also have the option of searching for flights in 3 hour time windows. 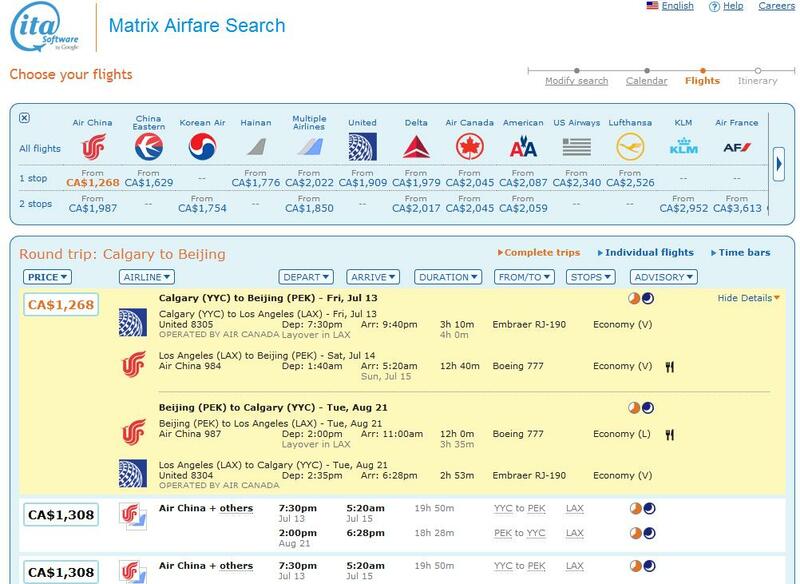 Since I know a loyal reader needs to go to Beijing in July I will use this as an example. Above I am using the calendar of fares option. If you click "Nearby" next to the cities you can see a list of other airport options. Calendar of results. 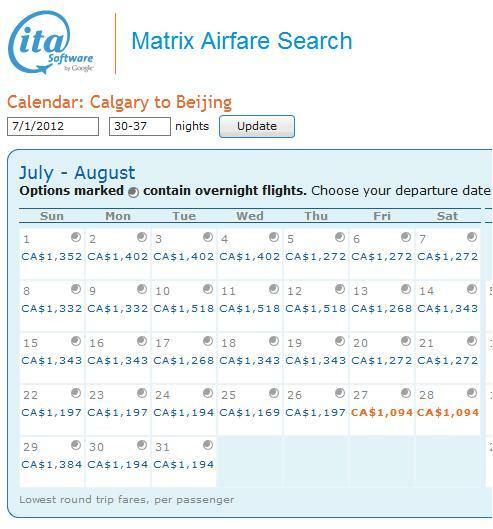 In this month fares to Beijing fluctuate by $424. Here are the results for July 13th. If you click "Details" it will show the following information which includes connection times and flights. Keep in mind the fares shown INCLUDE all taxes, fees and surcharges. It takes a bit of time to get acquainted with how everything works but at the end of the day this is a great tool. I guess Google agrees with me since they paid almost a billion dollars for it! This entry was posted in Flight and Airfare Tips and tagged travel, vacation. Bookmark the permalink. Truly amazing! You can see at a glance the cheapest days to travel!! Hi, I found a good fare but it is not showing in expedia, kayak….do you knoe why? thanks! Leny you can book it with the airline directly; on their website or you can call them which may have an additional charge.